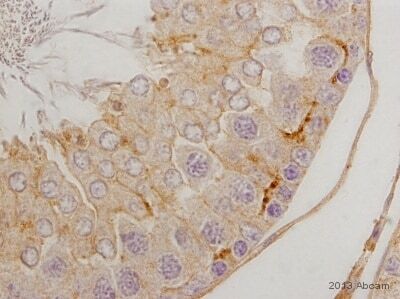 Rabbit polyclonal Oligodendrocyte Specific Protein antibody. Validated in WB, ELISA, IHC, ICC/IF and tested in Mouse, Rat, Sheep, Goat, Chicken, Cow, Cat, Human, Common marmoset. WB: Mouse brain extract. ICC/IF: Rat cortical neurons. 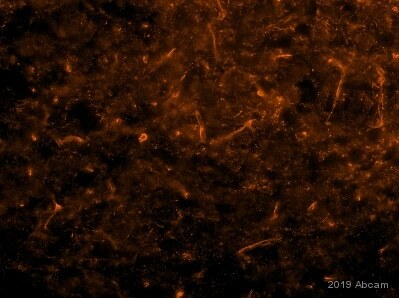 Mouse mixed glia cells. IHC-P: Cat and mouse brain tissue. IHC-Fr: Rat brain tissue. Our Abpromise guarantee covers the use of ab53041 in the following tested applications. WB 1/500 - 1/1000. Detects a band of approximately 22 kDa (predicted molecular weight: 22 kDa). 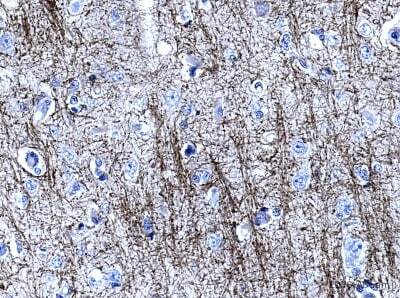 IF image of ab53041 staining cryopreserved rat cortical neurons grown for 20 to 29 DIV. Right panel showing a non treated culture (Control). Left panel showing cultures treated with Triodothyronine (T3), 60ng/mL, starting at 10 DIV. Cells were fixed with 4% paraformaldehyde containing 0.2% picric acid in 0.1M phosphate buffer, pH 6.9 for 20 minutes. The cells were then incubated at 4°C over night with ab53041 (1:200) diluted in PBS containing 0.3% Triton-X 100 (PBSTx). The secondary antibody used was ab150068 (1:200). ab53041 staining cat brain sections by IHC-P. The tissue was fixed with formaldehyde and a heat mediated antigen retrival step was performed with citric acid pH 6. Blocking of the sample was done with 1% BSA for 10 minutes at 21°C, followed by staining with ab53041 at 1/500 in TRIS/BSA/azide for 2h at 21°C. 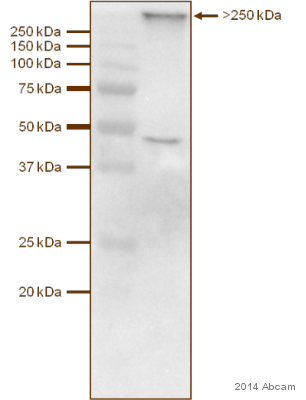 A biotinylated goat anti-rabbit polyclonal antibody was used as the secondary antibody. Immunocytochemistry/ Immunofluorescence - Anti-Oligodendrocyte Specific Protein antibody (ab53041)Image courtesy of an anonymous Abreview. 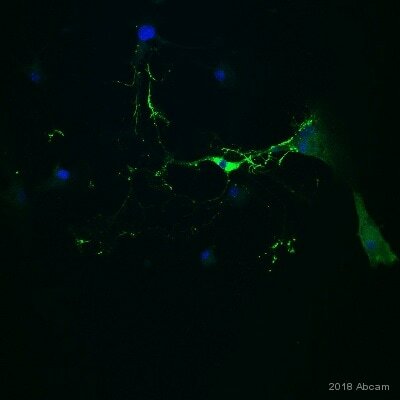 ab53041 staining Oligodendrocyte Specific Protein in mixed glia prepared from mouse brain by Immunocytochemistry/ Immunofluorescence. The cells were fixed in ice-cold methanol and then blocked using 20% serum with 0.5% Saponin for 1 hour at 4°C. Samples were then incubated with primary antibody at 1/200 for 2 hours at 23°C. 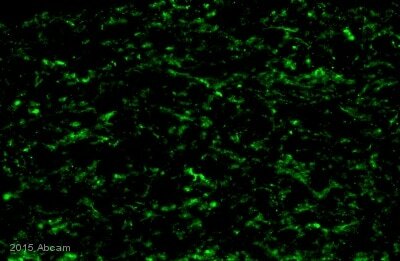 The secondary antibody used was a goat anti-rabbit IgG conjugated to Alexa Fluor® 488 (green) used at a 1/400 dilution. DAPI was used to stain the cell nuclei (blue). ab53041 diluted 1/500 in 2% normal goat serum staining rat brain tissue sections by IHC-Fr. The tissue was formaldehyde fixed and blocked with 2% serum for 30 minutes at 21°C before incubation with the primary antibody for 24 hours at 21°C. A biotinylated goat anti-rabbit antibody was used as the secondary. 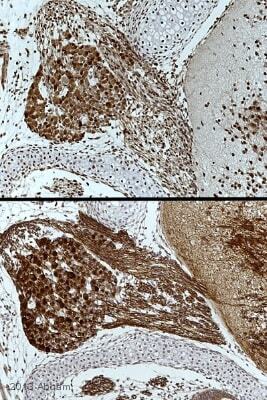 ab53041 staining Oligodendrocyte Specific Protein in mouse brain tissue section by Immunohistochemistry (PFA-fixed). The tissue sections were fixed with 4% paraformaldehyde.The primary antibody was diluted 1/3000 and incubated with sample for 16 hours at 4°C in PBS 0.3% Triton 8% BSA. An Alexa Fluor® 568 conjugated goat polyclonal to rabbit IgG was used at dilution 1/1000 as secondary antibody. The image was taken from the cortex of an adult mouse, near the midline. Publishing research using ab53041? Please let us know so that we can cite the reference in this datasheet.